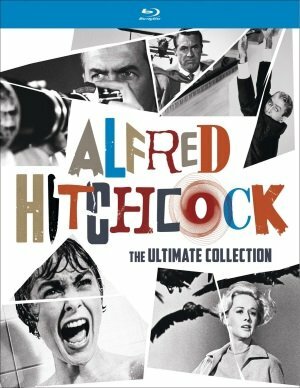 Alfred Hitchcock: The Ultimate Collection (Universal Pictures Home Entertainment, Blu-ray) – The box set of 15 Alfred Hitchcock pictures made between 1942 and 1976 (featuring films from Paramount, Warner Bros, and MGM as well as Universal Studios) expands on the 2012 Blu-ray box set Alfred Hitchcock: The Masterpiece Collection with two bonus DVDs highlighting Hitchcock’s work on the small screen. They’re not all masterpieces but they are all from the Master of Suspense so they all have their merits, and the discs are packed with supplements. Each disc includes a gallery of stills, a trailer, and a featurette written, produced and directed by specialist Laurent Bouzereau for the original DVD special edition releases of the films. Each runs between 30 and 45 minutes. Bouzereau constructs detailed stories of the creation and production of the films with the help of surviving artists and actors, and adds just a little interpretive insight. The later films, not surprisingly, feature more first person remembrances and run a little longer. Some discs include more supplements. Note that these are the exact same Blu-ray masters from the 2012 set, which means that the same issues are present in the five problematic discs. More on those later. Here’s the line-up, with notes on some select supplements.